Rare they are, a rare sight. There are so many parts of my Twitter timeline that I adore, but the photos rank quite highly on that list. Hot, hot, hot photos; clever and interesting choices; beautiful models; I could go on. So here is the first! 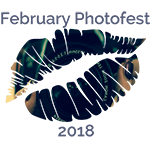 I might do this every Monday during Feb Photo Fest.